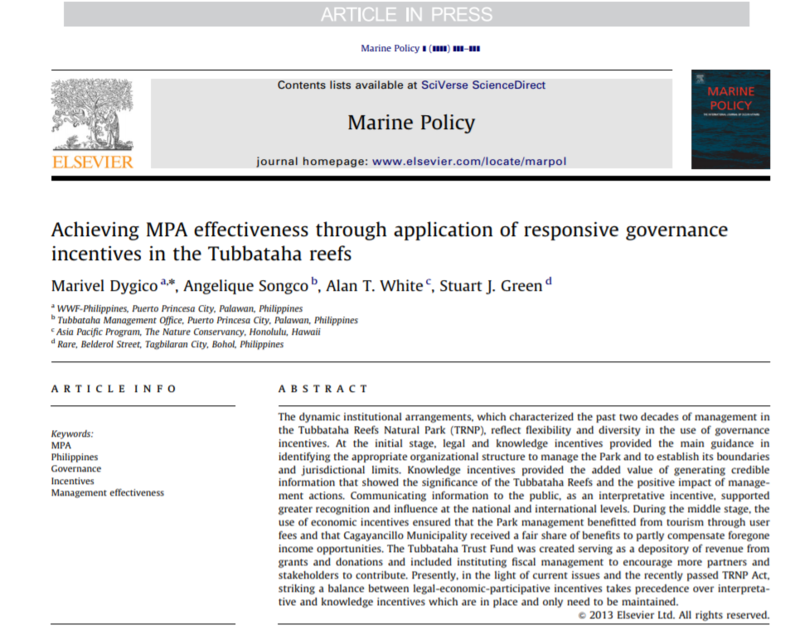 Abstract The dynamic institutional arrangements, which characterized the past two decades of management in the Tubbataha Reefs Natural Park (TRNP), reflect flexibility and diversity in the use of governance incentives. At the initial stage, legal and knowledge incentives provided the main guidance in identifying the appropriate organizational structure to manage the Park and to establish its boundaries and jurisdictional limits. Knowledge incentives provided the added value of generating credible information that showed the significance of the Tubbataha Reefs and the positive impact of manage- ment actions. Communicating information to the public, as an interpretative incentive, supported greater recognition and influence at the national and international levels. During the middle stage, the use of economic incentives ensured that the Park management benefitted from tourism through user fees and that Cagayancillo Municipality received a fair share of benefits to partly compensate foregone income opportunities. The Tubbataha Trust Fund was created serving as a depository of revenue from grants and donations and included instituting fiscal management to encourage more partners and stakeholders to contribute. Presently, in the light of current issues and the recently passed TRNP Act, striking a balance between legal-economic-participative incentives takes precedence over interpretative and knowledge incentives which are in place and only need to be maintained.